Summer means hot dogs, of course, but everyone has their own thoughts on the best way to dress them. (I like spicy mustard, a drop of ketchup, and lots of sauerkraut.) It can be tough to find wine that matches everyone’s preferred tastes, though, and with summer weather you also need a wine that can refresh without being heady. Enter an oft-overlooked category of wines: Italian Rosato, especially the styles coming from central and southern Italy. Rosato is the Italian name equivalent for rosé, yet while some Italian producers may have started using that now-ubiquitous term, most have stuck to their roots and continue to produce the pink stuff under its traditional namesake. The first thing to know is that this is not really the same type of rosé that’s typically flowing all over the Hamptons this time of year. It’s true that the color can range from barely pink to deep-red ruby, and what you get largely depends on two factors: climate where the grapes were grown and skin contact during the winemaking. Bear with me here, but the nitty-gritty explanation is that climate influences how intense the color and flavor will be because of the amount of sun the grapes get during the growing season. The more sun, the more photosynthesis. The more photosynthesis, the more sugar produced in the grape. The more sugar ripeness in the grape, typically the more phenolic ripeness (wine-speak for how much tannins and color compounds have developed in the grapes). This means wines coming from warmer, sunnier places will have more tannin and color. Skin contact — how much time the juice spends soaking with the grape skins absorbing the color and flavor — is the other factor, and for richer Rosato styles, the maceration time is longer than what usually happens in places like Provence, which is what many Americans think of as, like, a benchmark rosé. But just because the wines may be deep in color does not mean they are sweet. Yes, they will have more body and be fruitier rather than herbaceous. But if they are made with quality in mind, they won’t have had sugar added to sweeten them up, so the juice stands on its own — and with a dog. 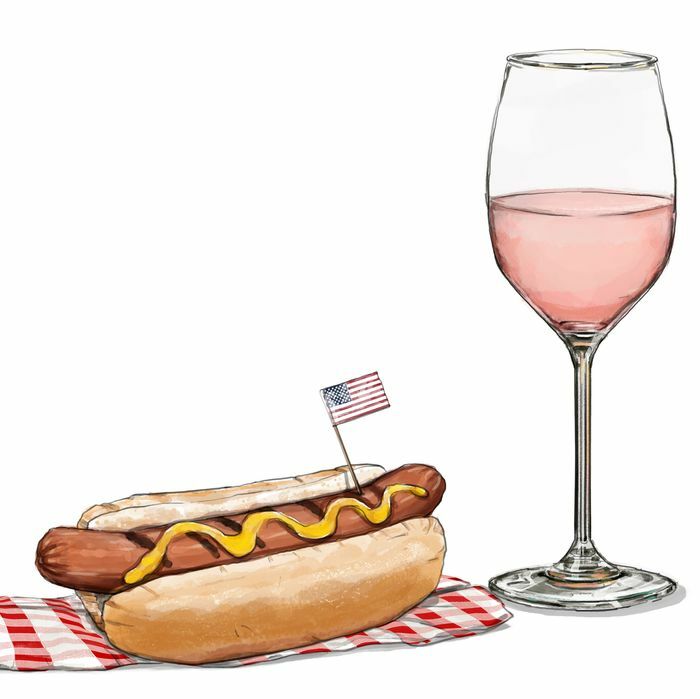 Here’s Why It Works: First, these wines have the crisp acidity of any well-made rosé that will help balance the fattiness of the frank. Their lightly grippy tannin will work with the protein for a super fun mouth party. And will they hold their ground regardless of the toppings/mustard? The tang will match the tang. Sauerkraut? The juicy texture will mesh with the sharpness of this topping. Ketchup? The salty aspect of both will be besties. Caramelized onions? The sweetness of the onions will cut against the bitter edge of a Rosato for a nice little balancing act. And to top it off, the colors for the central/southern styles are amazing. From fuchsia to magenta to ruby, they are a great color pop for any tablescape. This wine comes from a region in central Italy called Abruzzo. Here the hills are rugged and beautiful, much like this wine. An intensely colored and flavored expression coming from one of the most iconic wineries in Campania. The main grape in this wine is a funky one called Nerello Mascalese. Coming from the island of Sicily, this wine is the definition of a classic dark ruby Rosato.